Friends, I have been waiting to share this new nugget of goodness that has transformed our witching hour around here. You know what I mean by witching hour, yes? I think it hits everyone's house at slightly different times, but ours hits almost exactly from 4-5 PM every day. At this point, the kids have had their snacks, finished homework, and are not quite motivated enough to find something to entertain themselves (or one another). And so usually, they'd turn to me to play or to suggest a way for them to enjoy the next hour, and by that point, I'm frantically trying to wrap up work, get dinner on the table, and handle any other household chores that have been waiting on me. The combination of parent and child patience levels at their lowest is a recipe for disaster. In our last visit to the library, we spent some time in the audio book section, or the "read-alongs" as my kids call them. My youngest, L, at four, checks out quite a few of these because it's an easy way for me to have him attentive to books even when I can't be the one reading along with him. He loves the musical backgrounds and bonus songs that some of the books feature. His big sisters were reminiscing about their own experience of these picture books with audio and lamenting that they don't have the fun of these any more. Seeing that I had a teachable moment right in my hands, I walked with them to the audio books for kids section. Right away, they recognized titles that they had read and some that were on their wish lists. C, our newly confident reader, was happily surprised to find Mr. Popper's Penguins, one of her older sister's books that she'd been eyeing for a while. She hasn't quite had the gumption to pick it up on her own, but knowing that she could be read to and follow along broke down her fear. Through their elementary school, M and C are required to read or be read to a certain number of minutes per week. I have seen C's confidence grow as she listens along to the British narrator of the story tackle the complicated words and phrases with her. She's able to sink into the story a bit more and use her imagination to make the scenes come to life. This is not a substitute for her independent reading time but a nice addition to her learning. L memorizes his books through the great use of pattern, repetition, and song that professionals can provide. M loves the opportunity to put in headphones and be given permission to tune out to dive into a book. Since I have no audio learners (save my husband) in the house, this exercise has been a helpful way for them to expand their learning styles, too. Last week at 4:15, a moment I typically dread, I looked around to see all three of my children engaged in audio books - content, learning, and completely occupied. It was like a mini-retreat for me and dinner prep and dishes became an enjoyable experience. And we all came to dinner calmer. 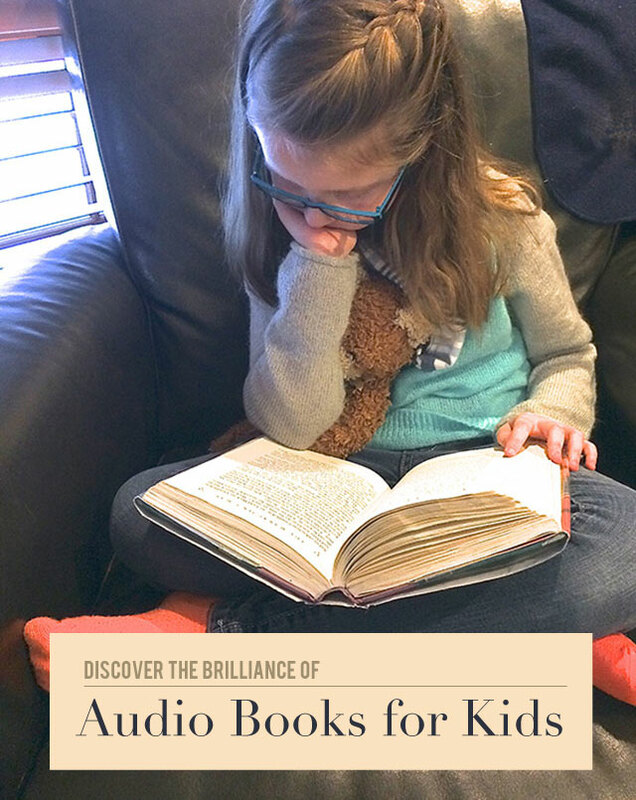 Have you tried audio books with your children? Do you utilize them for your own reading? Check out Paige's recommendations for some great audio books. P.S. Thanks to Ileana for this helpful suggestion: "I used audiobooks all throughout my daughters childhoods. The youngest would drift off to sleep with a "story tape" after we finished with bedtime reading. She is now addicted and still listens to audiobooks as a young woman. I credit the good vocabulary of my children with this habit. I wanted to pass on these two resources of great audiobooks, one the D'Aulaires Book of Greek Myths read by Paul Newman, Sidney Poitier, Kathleen Turner and others. The other is a collection of tales and fables for children by Jim Weiss (he has a very soothing voice)."